It is an ideal home experiment and science fair project. 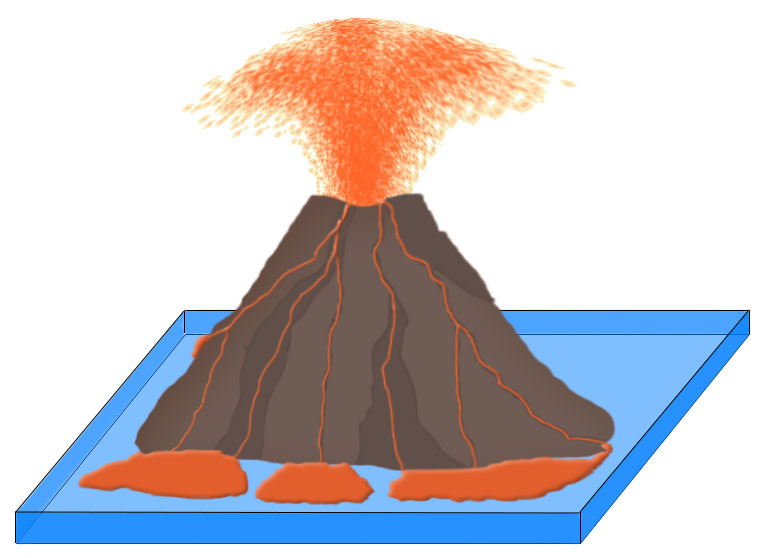 In this experiment, you will learn how lava is ejected from a volcano, and about the chemical reaction of vinegar and baking soda. We will use the materials from the kitchen to build a model of a volcano. It will look like a lava erupting mountain. Place the cardboard sheet on a clean surface, and put the empty plastic bottle on the center of the sheet. Use wet clay or wet wheat flour to cover the plastic bottle. Try to shape the clay like a rough mountain, and place stones around it. Be careful, clay/wheat flour should not be dropped inside the bottle, and also don’t cover the opening of the bottle. Dry your structure in sunlight until it is hard to break. Add 2 to 3 spoonful of baking soda and 4 drops of red food coloring in the bottle that you have covered with clay. Your Volcano is ready for eruption! Take your model where you want to perform it, then add some vinegar in the bottle to start the volcano. You will see, a red fountain of foamy liquid will come out of the volcano model. When baking soda (sodium bicarbonate) and vinegar (acetic acid) are mixed, they react with each other. As a result, gas bubbles made of carbon dioxide are produced. These bubbles build the pressure inside the bottle. This pressure force the foamy liquid out from the bottle. Use different quantities of baking soda and vinegar with different colors. Use three bottles in the place of one with three different colors (Red, Green, and Blue). Use glowing ink or powder with food coloring. Abdul Wahab, "How to Make Vinegar Volcano," in Science4Fun, April 13, 2019, http://science4fun.info/how-to-make-vinegar-volcano/.